SATURDAY, 22nd October, 3pm – 10pm, BLU-VINO Trinidad at The Anchorage (Chaguaramas). “Where will David Rudder, VOICE, Nuphoric and Tweez be on Saturday 22nd October? Blu-Vino Trinidad is the place to be – where wine-lovers unite! We have amassed an amazing selection of Red & White Wines, local & internationally produced, as well as Champagne, all of which will be served throughout the evening. Additionally, we’re putting your taste buds to the test by allowing you to individually score your favourite wines as you use the 5-(S)’s of wine tasting -SEE, SWIRL, SMELL, SIP & SWALLOW. Seduce your senses with wines from around the world, while indulging in sumptuous Cordon Bleu delights paired by our sommeliers & our Chef from the Ritz Carlton.” Link to event page and Purchase Tickets link. SATURDAY, October 29th, 9am – 3pm, WINE TASTING SEMINAR (short course) at Chaguaramas Campus of TTHTI (Trinidad and Tobago Hospitality and Tourism Institute.) Cost is $1000. Email info@tthti.edu.tt or call (868) 634-4250 for more information. SATURDAY, October 29th through November 19th, 9am – 3pm, ADVANCE CAKE & PASTRY MAKING (short ctourse) at San Fernando Campus of TTHTI (Trinidad and Tobago Hospitality and Tourism Institute.) Cost is $2050. Email info@tthti.edu.tt or call (868) 634-4250 for more information. SATURDAY, October 29th through November 26th, 9am – 3pm, CAKE DECORATING (short course) at Chaguaramas Campus of TTHTI (Trinidad and Tobago Hospitality and Tourism Institute.) Cost is $1850. Email info@tthti.edu.tt or call (868) 634-4250 for more information. SUNDAY, OCTOBER 30, OKTOBERFEST BRUNCH @ FANATIC, 11:30am – 2:30pm. 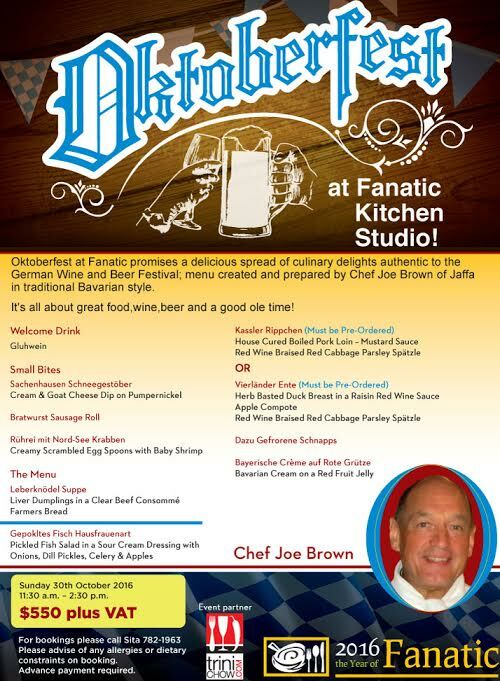 Sunday Brunch @ Fanatic with TriniChow features Executive Chef Joe Brown and a special Oktoberfest-inspired menu. (868)782-1963 for bookings. 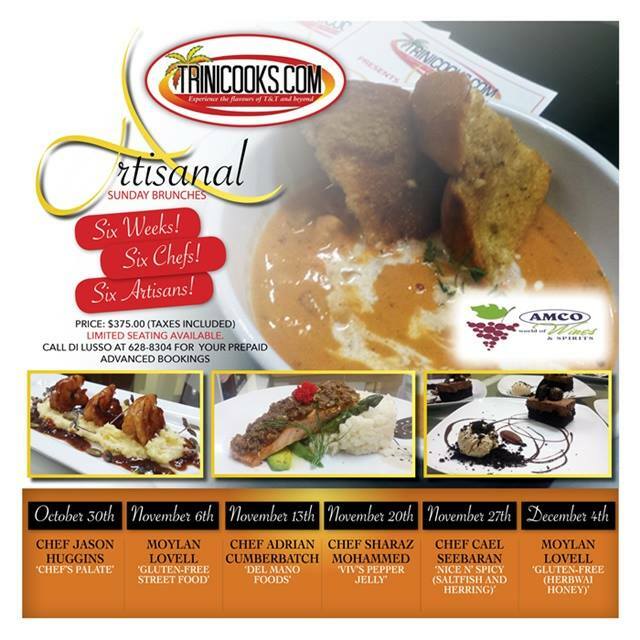 Link to menu and flyer. 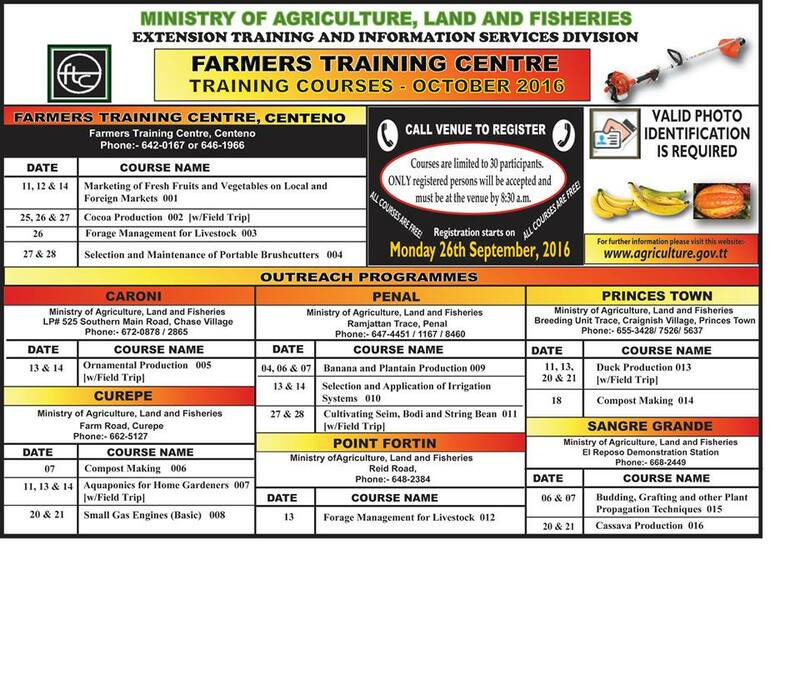 Ministry of Food Production Farmers Training Centre’s TRAINING COURSES: Classes include Aquaponics for Home Gardeners; Banana & Plant Production; Cocoa Production; and Marketing Fresh Fruits & Vegetables in Local and Foreign Markets. This month’s classes are offered in Caroni, Curepe, Centeno, Penal, Point Fortin, Princes Town and Sangre Grande. Link to OCTOBER 2016 schedule and booking information. FREE! RITUALS COFFE HOUSE (St. Anns, Trinidad) – Opened its 63rd Rituals location in St. Ann’s/Cascade at 30 St Anns Road. PIZZA BOYS (St. Anns, Trinidad) – Opened its 21st Pizza Boys location in St. Ann’s/Cascade at 30 St Anns Road. STARBUCKS (Movietowne – Port of Spain, Trinidad) – Opening its second location in Movietowne week on October 24th. BREADOLOGY (Corinth, Trinidad) – Coming soon to C3 Centre. SATURDAYS, October, from 10am, JUNIOR CHEF ACADEMY at The Academy of Baking and Pastry Arts, Methuen Street, Woodbrook. Open to children eleven (11) years. Email info@thebakingacademytt.com for more information. SATURDAYS, October 01st through November 19th, 9am – 3pm, PROFESSIONAL BARTENDING (short course) at Chaguaramas Campus of TTHTI (Trinidad and Tobago Hospitality and Tourism Institute.) Cost is $1650. Email info@tthti.edu.tt or call (868) 634-4250 for more information. Saturday, 15th October, 10am-12pm, San Antonio Green Market‘s – NOTHING WASTED Celebration of World Food Day (Santa Cruz, Trinidad). “We launch our Community Supported Agriculture (CSA) program at 10am with special talks for you to attend.” Link to full program. WEDNESDAY & THURSDAY, 19th – 20th October, 10am-5pm, WORLD FOOD DAY at the Dwight Yorke Stadium (Scarborough, Tobago). Tobago’s annual World Food Day returns with villages island-wide displaying prized produce and foods. Live-stock, poultry and fish products are also on display. Prepared food, fruits, vegetables and plants are available for purchase.